Hello and welcome to H-Bot NPC Hunter! If you are new to H-Bot you should read this guide no matter what operating mode you plan to run. The different operating modes of H-Bot have their own guides but this one is the initial configuration for all of them. It may seem quite lengthy at first glance but proper first time setup will save you time searching the forums and asking questions. H-Bot Npc Hunter is the most rewarding bot for EvE Online when it comes to ISK. It can reach 60+Millions ISK per hour with a good ship and decent skills but you need to configure it properly. Let’s start! It's strongly recommended to start from default EvE client. So it's better to create a copy of your EvE folder this way you can keep one EvE client with all your current settings, and use the copied one for H-Bot. Run EvE, hit escape->Reset settings and click [Clear all settings] button. First you have to do some changes in your eve settings. 1. Login to your character. 2. Press Esc and go to General Settings . 3. Change your Theme to "Dark Matter" and drag the Transparency slider to the left ( 0 ). 5. Make sure the Context Menu Fontsize is set to 10. 7. Set Windowed or Fullscreen to Window mode or Fixed. UI Scaling must be 100%.You are also advised to uncheck all the Effects (Turret, Effects, Missile, Camera Shake, Ship Explosions, Drone models and Trails). You are free to use any resolution you like as long as the layout of the in-game windows is according to the image in step 14 of this guide. 9. Check “Auto Reject Invitations” for chat and dueling because the invitation popup window could cause serious problems to the bot if not detected. If you plan to enable local chat monitor check “Log chat to file”. 10. Get back to EVE. 11. Fit any ship you like!Of course the best choice for Salvaging-Looting mode is Noctis but you can use any ship you like. 13. Now it’s time to board the ship you’ll be ratting or salvaging and get in space. If you are going to use drones just have the drones window opened and not contracted. You can have the drones window bellow the overview or on the left of it, or even on top of MY CARGO window. Just make sure drones window doesn’t cover the first target position on the left of Selected Item window. 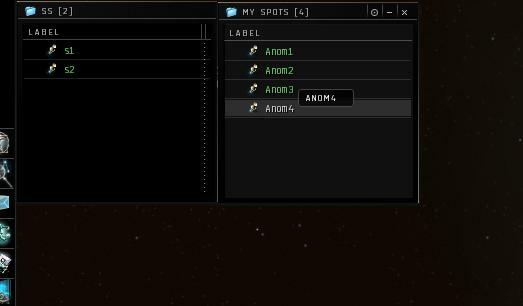 Go to EVE Settings->Shortcuts and add some shortcuts for the commands “All drones: Engage” and “All drones: Return to dronebay”. Recommended shortcuts are CTRL+KEY for example CTRL+1 and CTRL+2. Whatever shortcuts you select for the drones commands just go to H-Bot Hunter menu->Settings->Drones & Navigation and configure accordingly. You can use drones groups if you plan to use a drone boat just make sure to add the group names in drones settings of H-Bot. 15. You don’t have to match every pixel with the above image. Just make sure that local channel is expanded enough to show several players. Players are visible, players’ standings are visible, people and places (or better a bookmarks folder) with some safe spots is visible, ship’s cargo is open, overview is expanded to show the more belts it can, all windows are unpinned(non transparent). The HUD must be in bottom position and as centered as possible. 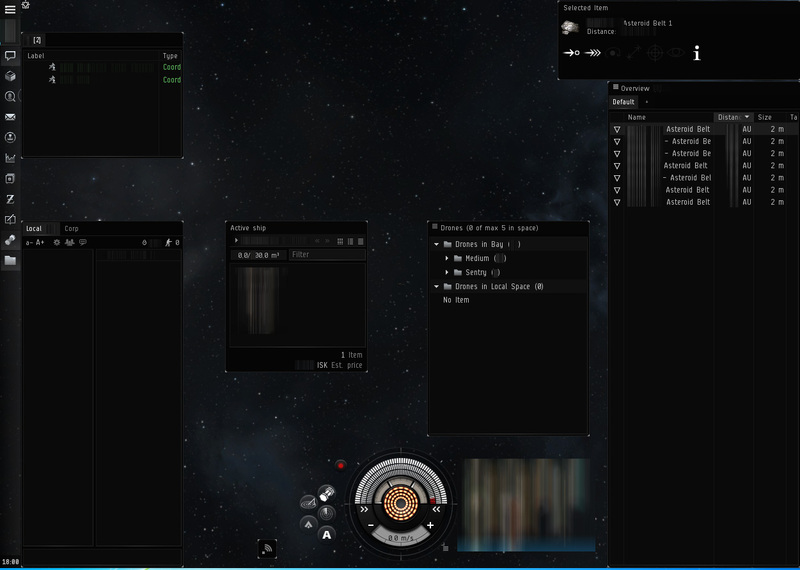 The local channel window should not be wider than the 1/3 of Eve window’s width and should be on the left side. Also don’t have other chat windows visible. If in your selected item window you have small buttons then just resize the window until the buttons swap to big. That’s it for the windows colors and layout part. Let’s configure overview settings. 19. Open overview settings and go to Appearance -> Background and set background for terrible, bad and neutral to RED and for excellent and good to BLUE. Uncheck everything else. 20. Go to Appearance->Colortag and leave only excellent, good, terrible, bad and neutral. Uncheck everything else. Also set standings to your own corporation to positive. You can do that by finding your corp in People&Places, right click->Add contact and set standing to positive. This way your corp-mates will be shown with blue plus symbols. 21. Now you need to create some overview setups. You can skip steps 22-29 by importing the overview included inside H-Bot Hunter installation directory or downloading one from reboot.gr download section. Just put the downloaded overview file in My Documents->EVE->Overview and import if from EvE. Before importing delete any overview selection types you have. If you don't want to import the provided overview and want to create them manually go to Filters and press [Deselect All] button. Only the ordering of the overviews is important and not the names so you are welcome to name your overviews as you like and the names I use are just an example. 22. Save this empty overview as “1 empty”. Now select only Gates (and Acceleration gates if you plan to run it for missions) and save it as “2 gates”. 23. Next, click [Deselect All] again then go to Filters->Types->Npc and check Pirate NPC. Also go to Filters->Types->Entity and check the Deadspace Overseer. 24. If you are going to use H-Bot in a system where another friendly pilots may be ratting, and you don’t want H-Bot to ks (kill steal) them, then go to Filters->Types->Ship and check the ships you want h-bot to detect and skip the site when friendly is there before you arrive. Also go to Filters->Types->Deployable and check Mobile Warp Disruptor. This way if you land on a site where someone anchored a bubble the bot will detect it and escape from it. 26. Press [Deselect All] button again. Go to Filters->Types->Celestial and check Asteroid Belt. 28. Create another overview setup with only wrecks and secure containers or Corp Hangar in it. In Filters->States uncheck the “Wreck is already viewed” and “Wreck is empty”. If you are going to use the salvaging modes don’t uncheck “Wreck is empty” so the empty wrecks are shown and salvaged. Save it as “5 something”. For example “5 wrecks”. 29. Create another overview showing only big asteroid rocks like Veldspar and Large Collidable objects and save it as “6 anything you like”. For example “6 rocks”. This overview is used if your ship gets stuck in rocks or structures and can’t warp out. H-Bot will load this overview and try to maneuver its way out. Lastly create the 7th overview with only Large Collidable Object in it. This is used for special actions in Anomaly Autoscan mode. You just finished preparing your eve’s interface. 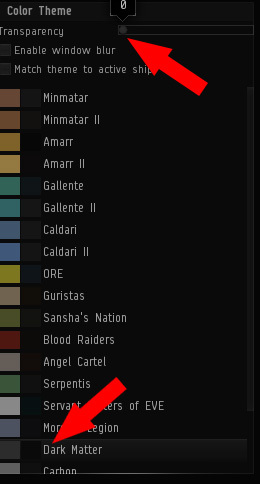 There are some more settings to do in Eve if you are planning to use containers to store loot and refill ammo. Also in different operating modes some changes should be done. I’ll explain these settings in detail bellow in this guide. Let’s move on to H-Bot. Run H-Bot NPC Hunter and login. You should see the below window. 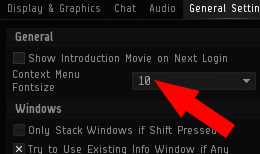 Hovering your mouse over every setting will show a tooltip with info about it. Bellow I’ll explain H-Bot Npc Hunter’s Basic settings. Step is the main timer of H-Bot. It’s actions frequency. Its minimum value is 500 and max is 4000. You can leave it at default value for now. Later you can tweak it and find a value that works better for you. Ov Lines is the number of lines that your overview is able to show. Local Max is the maximum number of players your local channel can show (without scrolling). Wait in SS is the approximate number of seconds that H-Bot will stay in safe spot after hostiles leaves the system.Wait offset is a random number of seconds added to the wait time. Wait spawn. When the bot lands on a belt it will wait the rats to spawn for (wait spawn) seconds. NoKill sec is a number used to prevent H-Bot from staying too long on difficult or buggy spawns. If it can’t kill a rat for NoKill seconds then it will warp to the next destination ignoring the rats. It’s useful when rats jam you all the time or when they spawn too far away from your ship. NoTarget sec.This is used as anti-jamming tool. If the bot will not manage to target anything after (no target sec) seconds it will warp to the next destination as most probably there are jamming rats keeping the ship almost perma-jammed. NumOfBelts is the number of belts in your system. You can ignore it and check the count belts box and H-Bot will count belts automatically. Quit eve if tank is very low. This is very important and should be enabled unless you are near the bot when it runs. The bot will log off Eve client if the ship tank is broken and the configured low tank point is reached. 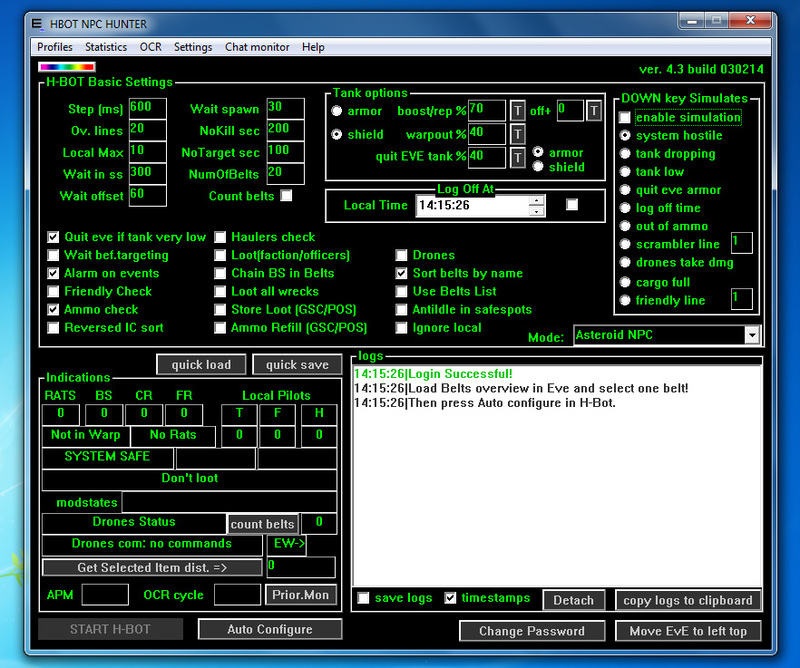 Configure the low tank in “quit EVE tank %” setting. If this option is unchecked the bot will just sound an alarm when it detects low tank. Wait bef.targeting. If you check this the bot will wait for the whole spawn to warp in before it starts targeting. If you are going to use “Loot faction/officers” or “Chaining” feature then have this checked. Alarm on Events. If you want the bot to sound alarms on important events check this box. Friendly check is used if you want h-bot to skip belts with a friendly pilot on it and don’t kill steal the rats. Ammo check. If you want the bot to monitor the ammo icon in cargo you should check this box. When ship runs out of ammo the bot has two options. Logoff eve or refill ammo from secure container. Reversed IC Sort is used to automatically reverse IC sort after sorting is changed. Have this disabled unless you find it useful. Haulers check is used to enable / disable monitoring overview for Hauler spawns and alarm when certain npc names are found. To configure the haulers names, go to menu->OCR->Haulers and input them there. Loot(faction/officers) is used to enable / disable looting faction and officer npcs. To configure which npcs you want to loot, go to menu->OCR->Looting and add the desired names there. Remember H-bot will loot only 1 wreck if it detects a faction or officer in overview. Add only the faction and officers and NOT common npc names. Chain BS in belts. Check this setting if you want the bot to chain Battleship rats in Asteroid Npc mode. I’ll explain chaining in more detail bellow in this guide. Loot all wrecks. H-Bot Hunter is able to loot all wrecks after it kills the rats. It will load the wrecks overview and approach/loot all your wrecks one by one. It will not loot wrecks not belonging to you (shown in yellow). Store Loot.This is an important feature to be combined with “Loot all wrecks”. Once the cargo of your ship is full the bot will warp to a special safespot and empty the cargo (except ammo) to secure containers anchored in space or to Corp Hanger in POS. To use this feature create a bookmark of your Giant secure container or Corp Hangar and configure the bookmark name in menu OCR->Settings. This bookmark should be visible under your normal safespotsr. Check the following image. You can see I use only 1 safespot in this example and I use a bookmark named “SECURE”. 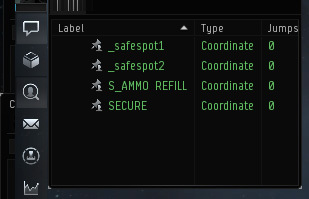 In this safespot you should anchor some Giant secure containers and give them different names. You can even have them password protected. Just go to menu->Settings->Loot&Store and input there how many GSC you have in your SEC safespot (Sec Containers #), when the bot should consider that the GSC is full and start using the next one (Sec cont cargo full at %) and the password you want to use in GSCs. Ammo refill. If you want the bot to refill ammo from a secure container or Corp Hangar you should check this box. The bookmark name must match again the one in menu OCR->Settings and should be visible under your normal safespots as shown in the image above. As you can see I use a bookmark named “AMMO” in that example. If you are going to use a GSC then anchor one with stacked ammo of the same type your weapons are charged with. This safespot should not have any other secure containers anchored. If you are going to use this feature it’s a good practice to check “Out of ammo if cargo is low” in Loot&Store settings. Sort belts by name is used to enable / disable automatically sorting overview by name when warping from belts to belts. This way you’ll assure H-Bot visits all the belts by name order and avoid warping to the same belts cause of strange eve’s overview changes when using IC sorting. Use belts list. 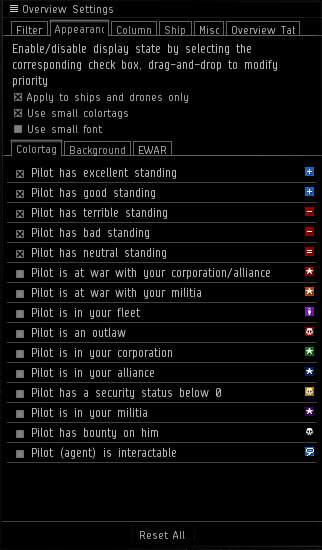 It’s strongly recommended to use belts list for Asteroids Npc Hunting mode. This way you can make the bot to warp to belts in shuffled order. This is very important as there are bot hunters out there who manage to calculate the next belt the bot will use when the bot warps from belt to belt in alphabetical order. If you check this option then go to menu->Other->Belts list and input the belts you want to use in any order. You can even leave some belts out (for example belts near the stargates). Anti idle in safespots is used to enable / disable random speed changes or modules activating when waiting in safespot to avoid being disconnected for idling. If you are using a POS as your safespot make sure to check “My safespots are inside POS” in Misc Settings. Ignore local can be used if you are testing h-bot in high sec and don’t need the local to be monitored for hostiles. That was it! I know it was quite some info but the more accurate you configure the bot the better it will operate and the more ISK it will earn. Bellow I will explain all the menu settings of H-Bot Hunter. Most of them are self-explanatory so you can skip reading it for now and come back if you don’t understand something. Just read the following paragraph and start using H-Bot. You have successfully setup H-Bot NPC Hunter and can now earn billions of isk afk! Load belts in overview and select one (it doesn’t matter what mode you are using. Loading belts and selecting one is mandatory before auto-configuring). If you are using drones make sure the drones window is visible and the two folders (Drones in bay and Drones in local space) are visible. Also drones window has enough height to show the drones hp boxes when they are launched in space. Then press Auto Configure and h-bot analyzes your display and auto configures coordinates. After auto configuration press [START H-BOT] button. If auto configuration fails check the logs for errors. Remember you can’t use your computer’s mouse and keyboard when the bot is running. If you want to be able to do other things while H-Bot is running you’ll need to install VMware and run EvE and H-Bot inside a virtual machine. You can find a guide on reboot.gr forum about VMware. H-Bot Npc Hunter menus explanation. Profiles->Manage Profiles. You can save/load different profiles for each ship or character. The “quick load” and “quick save” must be used if you only have one char and using one setup. You don’t need to press “quick save” and “quick load” if you are using Profiles. Statistics->Show. This will bring up a window showing some statistics for the last run of H-Bot Hunter. There you can see how many times the system turned hostile, how many times the ship warped to safespot, how many warp outs were due to a low tank event, how many times the ship skipped a belt because of NoKillTime event, how many npcs the bot encountered (not killed) and how long the bot was running. Statistics->Reset. You should press this if you pause the bot at some point and then want the statistics to be reset. If you close/open the bot statistics are reset so you don’t have to press anything. OCR->Kill Priority brings up a window where you can configure the order at which you want rats to get killed. You can input all the nasty jammers, scramblers, webbers etc. and give them high priority so they get killed first. The list is more useful in Anomalies mode. If you just prefer some npc class prioritized you can do that in the “priority by class” boxes. Set higher priority to the class you want to get shot first. OCR->Faction Looting. This will bring up a window where you should input faction and officers npc keywords for the Looting (faction/officers) feature. Keywords can be part of npc names. So for example if you are fighting Guristas, the correct key words list is the following: Dread, Kaikka, Estamel, Thon, Veppas.Same goes for the other races, meaning you don’t have to input all the faction npc names like “Dread Guristas Obliterator”, “Dread Guristas Eliminator” etc, only the keyword “Dread” is enough. OCR->Chaining. 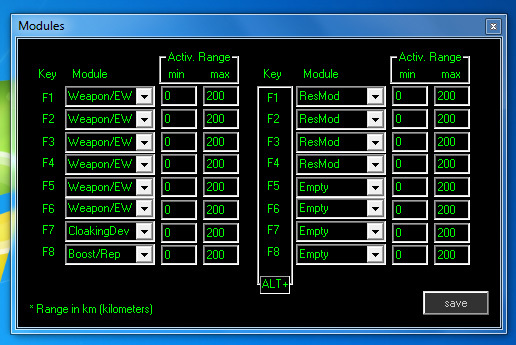 This will bring up a window where you should input the keywords of Battleship npcs worth chaining. If you don’t know what chaining is, I’ll explain it in a few words. In eve common (non faction, non officer, non hauler) spawns can be farmed by leaving at least one npc of the spawn alive. This way the killed npcs of the spawn will reappear after some minutes. So if you have a good spawn with high bounty BS rats you can farm this spawn by killing only the BS rats and leaving the rest. The Battleships will respawn after some minutes and you will keep killing them and leaving the worthless npcs alive. This dramatically increases the ISK income so it’s highly recommended to use the chaining feature. Keywords follow the same rule as in Looting so you can use partial names. If in a chaining spawn there is a scrambler you can select whether you want to wipe out that spawn or just kill the scrambler. OCR->Haulers npcs will bring up a window where you should input the keywords of Hauler Npcs. The bot will sound a specific alarm when it detects any of these keywords in overview. The keywords follow the same rule with Looting and Chaining. OCR->Settings. Here you can change the tolerance of the Optical Character Recognition functions used by H-Bot Hunter. The higher the values the more tolerant the functions will be with color differences and shades but at the same time the functions become slower. In general leave it at default values unless you get error messages like “Couldn’t find launch drones text” etc. Settings->Drones&Navigatiog brings up a window to configure Drones and Ship Navigation. Most settings are self-explanatory but I’ll point out some important ones. Don’t use too high scooping timeout cause when hostile jumps in you don’t want your ship to wait too long for the drones. It will give the drones the Return to Bay command so it can start the warp to safespot function and the drones will most probably make their way to the bay. Also if you are using a ship where drones are very important, a drone boat for example like Ishtar you must check the “Log off EVE on drones disable or lost”. This way if your drones are lost or disabled because of some error the bot will warp your ship to safespot and logoff. Settings->Escape maneuvers. Here you can configure how the bot reacts when it detects the ship is caught in something and needs to escape. All options are self-explanatory. Settings->Alarm settings. If you want to hear only some of the alarms then check only these ones and leave the other unchecked. Settings->Belts List. 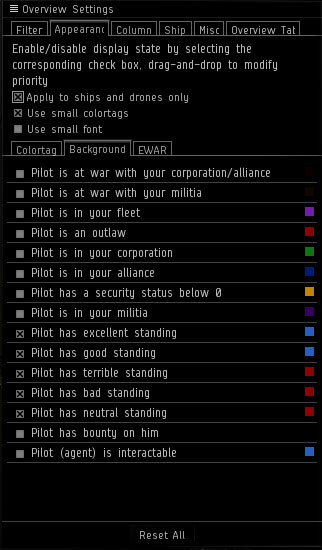 The belts list is a very important feature and should be used by all the pilots. Input here the numbers of the belts you want to use. Of course you should check the “Use Belts List” in main H-Bot Hunter’s window as well as “sort belts by name” so it works properly. Settings->Email alerts. The bot is capable sending email alerts on important events. This way you can approach your pc and make sure you don’t lose officer loot etc because of some minor issues like looting timeout etc. Settings->Loot&Store. I’ve already explained some of the settings in step 62 of the setup guide. Ammo refill amount is the amount of ammo the bot will drag and drop from secure container to your cargo when the ship runs out of ammo. Note that the “Sec cont. password” is used for bot AMMO and SECURE GSCs. Settings->Anomalies. Here are all the necessary settings for the Anomalies modes. Settings->Modules. Here you should configure your ship’s setup. Settings->Misc Settings. Again settings are self-explanatory here. Settings->Human like behavior. Here you can make H-Bot more human like by adding breaks and random timer offsets. In this mode you don’t need to do any more configurations. In Just Fight mode you'll need the above folder as well, with only one bookmark in it. The bot will fight in that bookmark and warpout/warpin when needed (hostiles, tank etc.). This is useful to run the fighting part of missions or for anything else when you need the bot just to fight and keep you safe afk. Check “jump to accel gates in Just fight mode” and add acceleration gates to 2nd overview if they are not shown to make H-Bot activate acceleration gates when all rats are killed.